2017 has been a truly remarkable and exciting year for Kids v Cancer. This year, the United States Congress passed our RACE for Children Act, requiring companies developing cancer targeted therapies for adults to also develop the drugs for children. Kids are dying because there are no drugs to treat them. If new drugs aren’t tested in kids, the therapies that are transforming cancer for adults won’t be there for children. That’s why we pushed so hard for the RACE for Children Act. The impact of RACE for Children Act will be profound. There are 900 drugs in the adult cancer pipeline. Now, only a handful are in development for children. Most drugs prescribed for kids with cancer are over 20 years old. As the RACE for Children goes into effect, almost the entire adult cancer drug pipeline could be open for children. The RACE for Children Act is the second law Kids v Cancer has played the leading role in getting Congress to enact. In 2012 Congress passed the Creating Hope Act, establishing the pediatric priority review voucher program. It created an incentive for companies to develop drugs expressly for children with cancer and other rare diseases. And in 2016, Congress reauthorized that program. The passage of both the Creating Hope Act and the RACE for Children Act are huge victories that will give kids more chances to bake brownies, wait for tooth fairies, shoot hoops, visit college campuses, and return home on Thanksgiving, Hanukkah and Christmas. 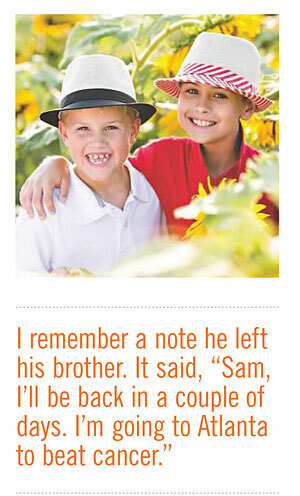 We started Kids v Cancer in 2009 when our 10-year-old son, Jacob, died of brain cancer. So many of you were there to love Jacob and love us as we went through the heart-wrenching moments of his illness and death. Through this experience, we met other beautiful children and families touched by pediatric cancer. We became a tribe. This is an analytical letter and Kids v Cancer is a professional organization, but at the root of our efforts is love and loss and an immense hope that one day children will not suffer from cancer as our kids have. The day after Jacob died, we founded Kids v Cancer to answer the question: What are the barriers to pediatric cancer research and how can they be removed so that we can get many more new therapies for kids? How can we encourage the private pharmaceutical industry to develop drugs for kids? The lack of interest from the biotech and pharmaceutical industries in making drugs for kids was our first focus. 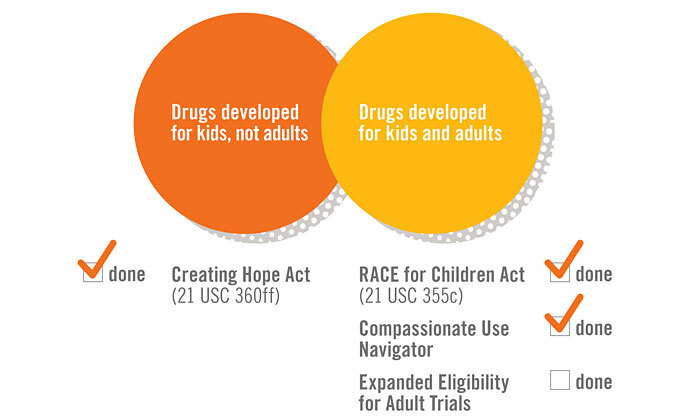 We drafted the Creating Hope Act pediatric priority review voucher program to create an incentive for drug development expressly for children with cancer. The Creating Hope Act program has been a stunning success. We are proud that it has created measurable incentives for creating drugs for pediatric cancer and other rare diseases. Since its passage in 2012, 11 vouchers have been awarded, and four vouchers have been sold at prices up to $350 million each. This has changed the dynamic within companies and made a focus on pediatric research and drug development commercially attractive. We are hearing real life examples of companies that have steered towards pediatric drug development as a consequence of this program. One such case was Novartis’ decision to move ahead with the development of the first CAR-T drug for pediatric leukemia. In other cases, researchers are reporting to us that companies are noticeably more interested and willing to work with pediatric oncologists and are funding pediatric cancer research at dramatically higher rates than they did 5 years ago. We were thrilled to create an incentive for drugs developed for children with cancer. However, the vast majority of cancer drugs are still being developed just for adults. We started to solve this problem by authoring and championing the RACE for Children Act. The RACE for Children Act requires companies developing their targeted cancer drugs to study those drugs in children with cancer. We have been working on the RACE for Children Act since 2013. We asked kids — kids with cancer, and brothers and sisters — to come to Capitol Hill to tell their stories. We hired top-rate academics to draft papers reviewing the policy. We are grateful for the pro bono services of law firms to create early drafts of the RACE for Children Act. Over 250 medical cancer centers and pediatric advocacy groups joined together to endorse the RACE for Children Act and ask Congress for its passage. Many other pediatric cancer advocacy groups joined in a thundering voice. And in the end, Members of Congress and their staff were beyond brilliant and undertook Herculean efforts to get the RACE for Children Act across the finish line. There’s still more to do to ensure the RACE for Children Act is implemented with maximum effect. We must work to provide researchers and companies with the information they need to determine which adult investigational drugs should be studied in which pediatric cancers. We must support FDA medical officers so that they are fully informed about ideas for pediatric study plans. We need to push for enforcement mechanisms to ensure completion of the required pediatric studies. But all in all, the Creating Hope Act and the RACE for Children Act advance our mission to change the landscape of pediatric cancer research. We have been facilitating the donation of pediatric autopsy brain tumor tissue. We have built a Compassionate Use Navigator that helps parents and physicians access experimental drugs. We have built an exciting Youth Lobbying Program and have an active Youth Board. We are advocating for inclusion of kids into clinical trials from which they are excluded only because of their age. We are grateful for the recognition we have received for our work. Nature journal endorsed the RACE for Children Act bill. Then, Science magazine reported on our success. You may recall we won the Peter Drucker Award for Nonprofit Innovation in 2015 and were designated as #4 on Fast Company’s top 10 nonprofits in 2016. We may be the most leveraged charitable contribution you can make. We have led the effort to change the landscape for pediatric cancer research with two new federal laws (one that has already created over $1 billion in incentives for pediatric drug development), an autopsy tissue program, a Compassionate Use Navigator, a youth lobbying program – all on a shoestring. That’s crazy good leverage. Thank you for thinking of us and thinking of children with cancer this holiday season. We are grateful for your generous support.